On Sunday, we will ride the sacred roads of the Tour of Flanders. We start and finish on the top of the Wall of Geraardsbergen, the most famous climb of the region where countless of Tours of Flanders have been decided. Further along the route we will conquer mythical climbs like Oude Kwaremont, Paterberg & Koppenberg. And don’t forget the cobbled sections of Mater and the Mariaborrestraat. On the way we’ll have a short lunch in the Centre Tour of Flanders in Oudenaarde, a place absolutely steeped in cycling history. Oh, and on top of the Wall of Geraardsbergen is café “‘t Hemelrijck” (The Kingdom of Heaven), a typical Flemish café known for it’s excellent selection of local beers. Also during this ride there is the option to opt for a shorter tour that will begin and end in Oudenaarde, leaving more time to enjoy some of the more pleasant aspects of Belgian cycling. 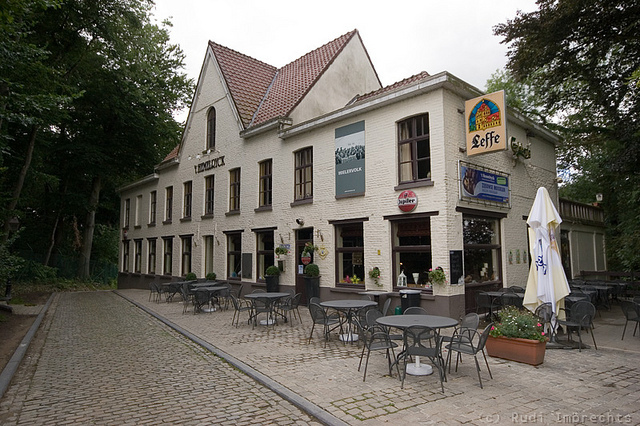 Like a quick stop in Café De Koppenberg or a great coffee in the square of the artist village of Kwaremont.